From diverse filmmaker/producer Joe Berlinger (the man behind one of the best music docs of all time, Metallica: Some Kind of Monster), comes this documentary about the tumultuous recording of Paul Simon’s masterpiece album ‘Graceland’ during a notorious 12 day stint to apartheid stricken South Africa. Twenty years since his last visit, the talented one out of Simon & Garfunkel returns to Johannesburg to meet the artists who made it all possible, and the politicians who tried to stop it. I’ve loved Paul Simon’s back catalogue for years; even the awkward nineties stuff – love it. A staple of American pop music, I was caught unaware by the fabulous backstory behind this 14 million copies sold, Grammy award-winning album Released before my birth, perhaps that’s unsurprising. But it does not make it ok. A culture-clash tale of of white vs. black, artistic freedom and rebelling against the rebels, Under African Skies is certainly a loaded documentary, but it has such a casual, TV-movie approachability that I was happy to let it’s loaded political points wash over me. Although the documentary participants are less difficult than the egocentric idiots who fill his Metallica doc, Berlinger manages to be just as stern and provocative here, with the arc of the documentary revolving around a first-time meeting between Paul Simon and the former Artists Against Apartheid protester, and son of famous black nationalist politician Oliver Tambo, Dali Tambo. Their coffee date isn’t as heated nor contestable as one would have hoped, but the balanced conversation reveals some worthwhile insight about the 25 year disagreement between the two. Along with the politics, we also get the fabulous music to draw us in to the social commentary. 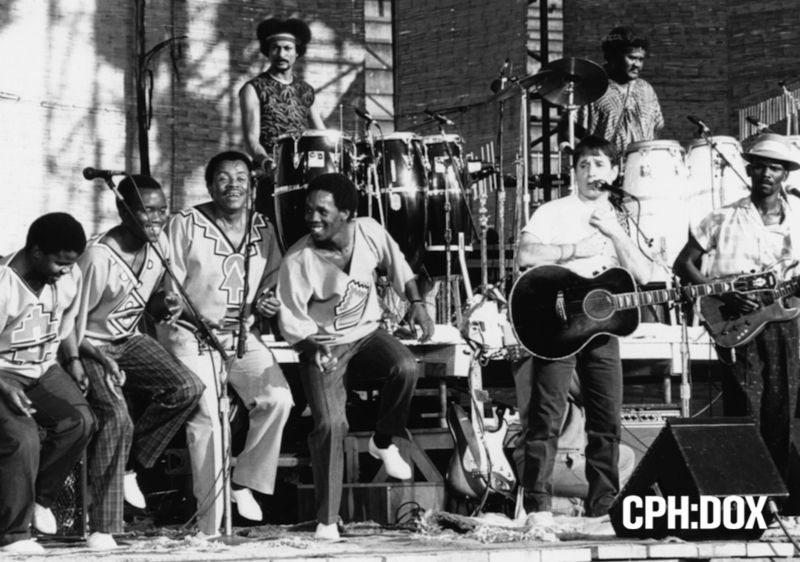 African bass rhythms and acapella choirs with Paul Simon’s sprightly guitar and irreverent lyricism: how could that be anything less than harmonious? A perennially brilliant mix of cultures and styles, which has gone on to influence new artists infinitum, which Berlinger goes on to prove with talking head interviews from the likes of Talking Heads frontman David Byrne, exiled blues singer Hugh Masekela and Paul Simon disciples’ Vampire Weekend, waxing lyrical about the cherished record. Whether you are a Paul Simon fan or not (you definitely should be, by the way), Under African Skies works best as a historical exposition about the apartheid. Teaching you about the harsh social controversy surrounding the album release and it’s subsequent world tour, rather than idle chat on Simon’s chord structure (although some light on his absurdist lyrics was enlightening). 26 years on from the album launch, and 22 since Mandela’s momentous prison release, it’s a recent history which Under African Skies makes sure we don’t forget. This entry was posted in ★★★★☆ (4) and tagged apartheid, artist against apartheid, Boyoyo Boys, cph dox, cphdox, dali tambo, David Byrne, diamonds on the souls of her shoes, graceland album, harry belafonte, hugh masekela, joe berlinger, Joseph Shabalala, ladysmith black mambazo, maya angelou, miriam makeba, Music documentary, Paul McCartney, paul simon, paul simon movie, peter gabriel, philip glass, quincy jones, simon & garfunkel, south africa documentary, Talking Heads, under african skies, vampire weekend, you can call me al. Bookmark the permalink.